Deva was born to M. C. Chokkalingam and M. C. Krishnaveni. Even in his childhood, Deva was attracted to the world of music. Teaming up with Chandra Bose, he staged many musical programmes. He started learning classical music under Dhanraj and completed a course in Western music at Trinity College of Music in London. His son Srikanth Deva is also a music director, as are his brothers, who have formed the duo Sabesh-Murali. His nephew Jai is an actor. Before coming to cinema, Deva worked for some time in the television field. In those days Deva's brothers were working in the musical troupes of Illayaraja and other music directors as instrumentalists. But Deva took special interests for self-improvement in his profession and at the same time he was looking for chances to enter movies. But the benefits of those efforts did not bear fruit easily. Only after much hardship he managed to enter the field with the help of some friends and his four brothers. 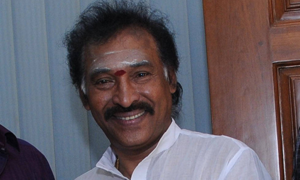 Just after his entry, the production work of those films, for which negotiations were on for fixing Deva as the music director, could not get completed and some other films with his music could not be released at all. Deva continued his search for an opening, which finally began yielding results in 1989. His first film, Manasukkeththa Maharaasaa, was released in 1989. He was then called to work on the movie Vaikaasi Poranthaachu. This film was a huge hit and Deva was praised for his work. After the release of Vaikaasi Poranthaachu, his name became known throughout the Tamil community. So far he has composed music for more than 400 films, which include Tamil, Telugu and Malayalam films. He is also famous for his compositions for religious films. He was widely acclaimed for his scores for Rajinikanth starrer Basha. His other famous compositions include Annamalai and Baasha, both starring Rajnikanth. As a brother Deva showers upon them (brothers) his heart-felt felicitations and his brothers, on their part, continue to take greater pains professionally, to add to the well-meaning achievements of Deva in the future also! This quality of Deva has enhanced his image among the top brass of the cineworld! Hence, veteran music director M.S.Viswanathan has conferred upon Deva the most suitably coined title, "Thenisai Thentral". As if doing full justification to this title, Deva's tunes and musical scores never fail to pour sweet honey in the form of melodious songs into our 'yearning' ears! Among the films whose music was composed by Deva, 7 became silver jubilee hits! 100 days films were 34. He recently made a special appearance in the film Modhi Vilayadu. On 31 July 2011, Tamilnadu chiefminister Jayalalitha has made him as the head of the Tamil Nadu Iyal Isai Nadaga Mandram.